The Technical Committee of Lloyd's Register of Shipping has approved new Rules for Inwater Surveys and a number of additions and amendments to the Rules for the Construction and Classification of Steel Ships, subject to confirmation by the General Committee. Rules for Inwater Surveys— These new Rules are intended to permit owners of large vessels to obtain exemption from certain docking surveys on ships in good condition. 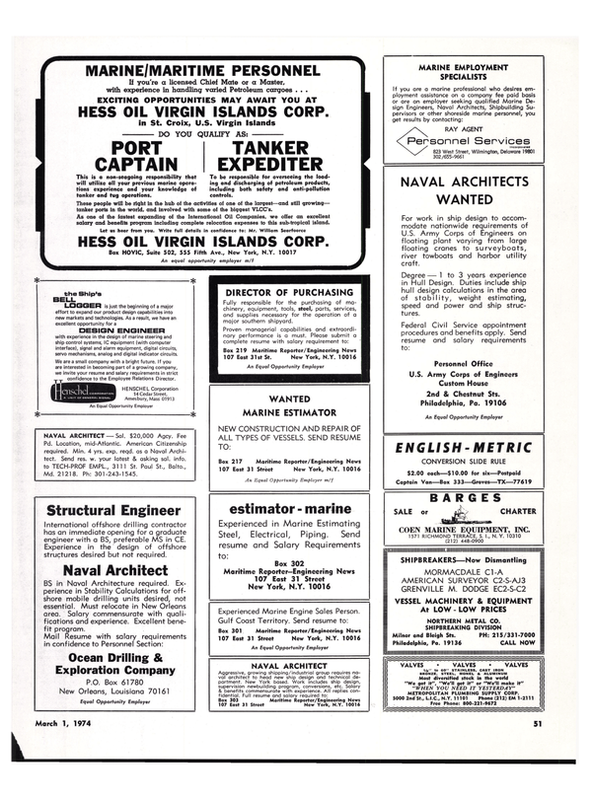 The Rules are applicable to ships of a suitable design which are properly marked with some sort of reference grid to enable underwater surveys to be effectively undertaken. The Rules also provide for the approval by Lloyd's Register of appropriately qualified firms capable of carrying out underwater surveys under the supervision of Lloyd's Register surveyors. Longitudinal Strength of Ships— A reduction in the hull modulus requirements for oil tankers and for ships intended for the carriage of ore or other heavy cargoes has been agreed. The strength standards' as applied to ordinary cargoships may be used, provided that specific care is exercised to ensure that panel stability against buckling is maintained at a satisfactory level. Movable Decks on Ferries and Car Carriers—Owners are now permitted to apply for the class notation "Movable Decks" to be granted for ships on which all movable decks, including vehicle ramps and their stowage arrangements, comply with Lloyd's Register's published Rules. Such a notation will be of particular benefit to owners of ships who are required to comply with the recently enacted Norwegian regulations for movable decks. The Diameter of Certain Machinery Shafts—Amendments have been made to the diameters at present required for certain items of line shafting which are based on the diameter required for the intermediate shaft, with a view to achieving a unified approach by all the major classification societies. Inert Gas Systems on Tankers— The requirements have been amended taking into account comments which have been received from industry regarding the construction and,operation of these plants. The amendments also take into account the acceptance of the gas turbine as a source of inert gas supply, the draft IMCO regulations for inert gas systems and the proposed amendments to the IACS unified requirements for inert gas systems. Requirements for Hull Structural Steels—Some amendments have been made, principally to achieve alignment with the proposed IACS revisions to the unified requirements for mild steels and to the agreed IACS requirements for higher tensile steels.